Not every University of Dayton student has a sandwich named after him. 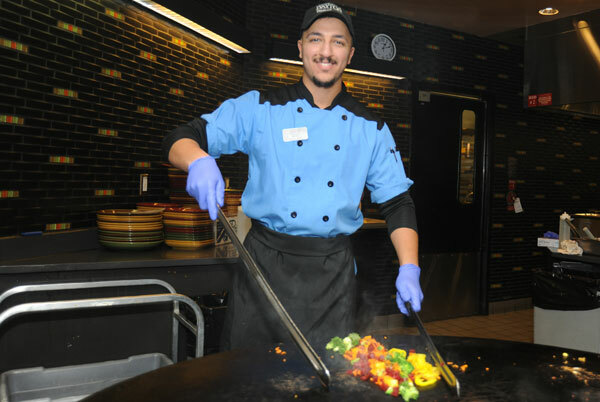 But not every student is Bader Almuntafkey, a personable cook at Passports restaurant in Virginia W. Kettering Residence Hall. He juggles studying mechanical and aerospace engineering with creating chicken shawarma, kebabs and his signature Arabic burger so tasty that students line up for it after he spreads the word on social media. I met Bader in December when I toured our exceptional array of restaurants on campus with Andy Horner, executive vice president for business and administrative services. Bader so impressed me with his friendliness, sincerity, and upbeat attitude that I invited him over to the president’s office to learn more about what brought him to the University of Dayton, where he and other students from around the globe have enriched the campus experience for all. He arrived with a bag of freshly cooked chicken wings and a captivating life story. “My story is a movie,” he said, without exaggeration. Yet, despite seemingly insurmountable challenges, he’s well on his way to becoming an American citizen this spring and earning his University of Dayton degree. Born in Basra in Southern Iraq, he told me he moved with his family to Baghdad at a young age. As a fourth grader during the Iraq War, he watched a classmate die in front of him when a helicopter hit their school, and bombs blasted out the windows. For a decade, he lived and studied in Kuwait before the family received visas for the U.S. in 2014. They chose Dayton because Iraqi neighbors had already immigrated here, but soon the dream of a new life turned into a nightmare when Bader’s father, a mechanical engineer, died of multiple myeloma just two days after his sister and her family joined them. Today, Bader works, studies, and helps take care of his mother, who knows little English. Bader’s account of how he discovered the University of Dayton is pure serendipity. Visiting his ill father at Miami Valley Hospital, he googled “Halal food,” and VWK’s Passports restaurant popped up. He stopped by for a meal and was soon hired for a part-time position that turned into a full-time job. Bader is quick to credit staff like Sue Falter and Nate Perry and professors who have helped him feel comfortable, navigate the admission process, and discover that biomechanics might be a field to pursue because of his love for sports and fitness. Bader has made a difficult journey look like just another fork in the road. He’s already fulfilled his father’s dream — and become a bit of a celebrity on campus with his own trademark sandwich.